In turn-of-the-twentieth-century Japan, a young woman (Meiko Kaji) has been trained since birth to exact bloody vengeance on those who abducted and raped her mother and murdered her mother's family. 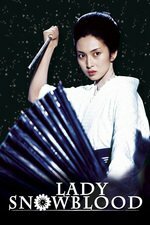 Director Toshiya Fujita is best known for this film and its sequel, Lady Snowblood 2: Love Song of Vengeance. However, they were actually atypical of his work. In Japan he was known for his dramas and softcore "pink films". If some of Lady Snowblood's imagery seems familiar, that might be because it had a major influence on Kill Bill. I just watched a double feature of this and its sequel on the big screen (Nya! Nya! Nya! ), but both films are available on Hulu Plus, Amazon and iTunes. In other words, loved the movie. It is a little distracting to finally watch this after seeing so much that's ripped this off. Fun movie though even if that garishly bright 1970s blood is pretty hilarious.